today's we are glimpsing at some body art that i caught at cleveland's carol and john's comic book shop - in this humble mouse's opinion the best comic shop in the known universe. okay, if it's not the best comic shop in the universe, i can say without exaggeration that carol and john's repeatedly is recognized as the best comic shop in cleveland and northern ohio. this past weekend friends from out of town were visiting, one of them asked if there was a comic shop nearby. he had recently heard a story on npr about a new spiderman. the recent death of peter parker (aka spiderman) at the hands of the evil green goblin wasn't necessarily the death of our much loved spidey. this month marvel revealed the identity of the new spiderman - miles morales. even though my visiting friend isn't a comic book collector, he was keen to try to find a copy of the newest issue. as fate would have it carol and john's had two copies; so m picked up a copy (along with the six issues leading up to the death of peter parker and the introduction of miles morales, i might add). i snagged the remaining issue, i figured after reading it i'd send it to my 30-year old nephew adrian who once had a serious spiderman fixation (i seem to remember he liked to wear his spiderman costume 24/7 when he was a wee lad). but enough with spiderman, let's get to the tats! the top two photos are of store owners, john and carol - who incidentally are mother and son - how cool is that! prior to going into the comic biz full time, john worked for 17 years as a firefighter with the cleveland fire department. 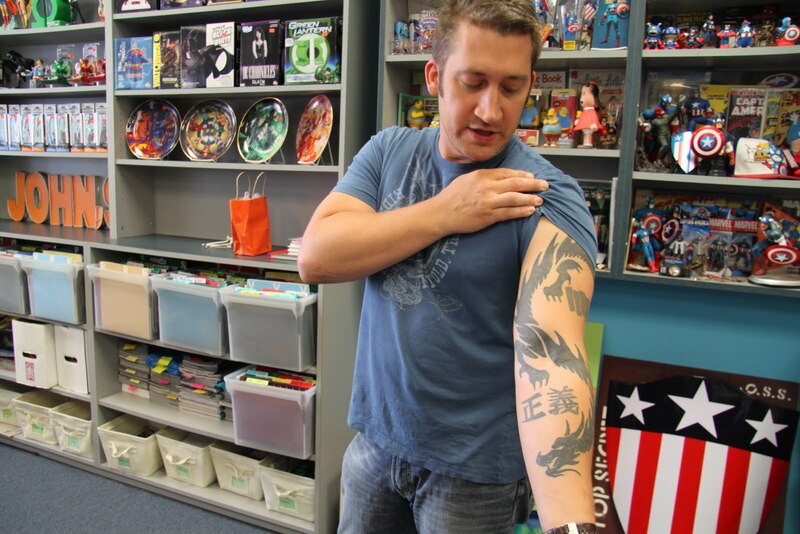 the dragon that we see on his left arm reflects his firefighting days. john explained that hundreds of years ago japanese firefighters would wear protective coats embroidered with elaborate images of dragons, over time the embroidery of dragons gave way to tattoos for japanese firefighters. today firefighters everywhere have embraced the iconography of the dragon as a symbol of protection, courage and strength. like son, like mother - carol is also adorned with several tattoos. the one visible on her right forearm shows, a peacock feather, a wisp of smoke, and carol written in kanji. 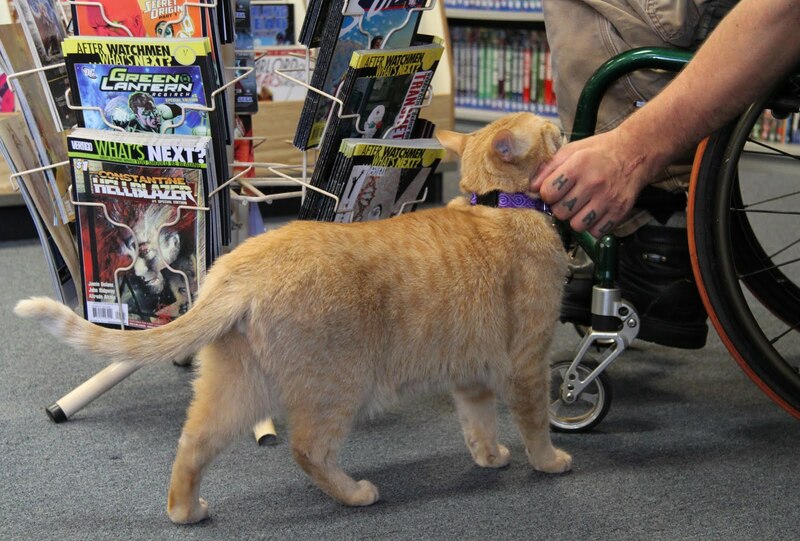 as i was leaving the store i noticed one more tat, this one on the knuckles of a customer petting winston zeddemore, the store cat and mascot. cleveland boasts a long and fine comic book history. did you know that cleveland is the home to superman? 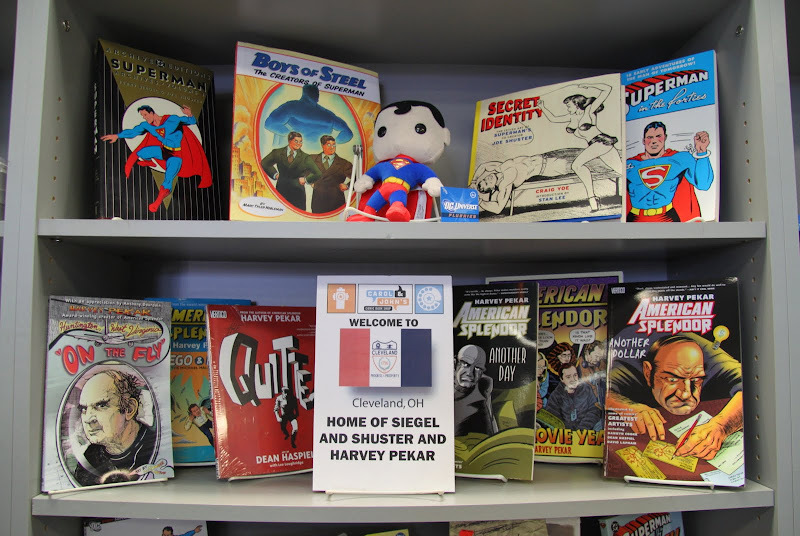 yep, back in the dark days of the great depression, cleveland teens jerry siegel and joe shuster, dreamed up superman - who is perhaps the first real comic superhero. more recently, cleveland is home to the late harvey pekar, best known as the author of american splendor. 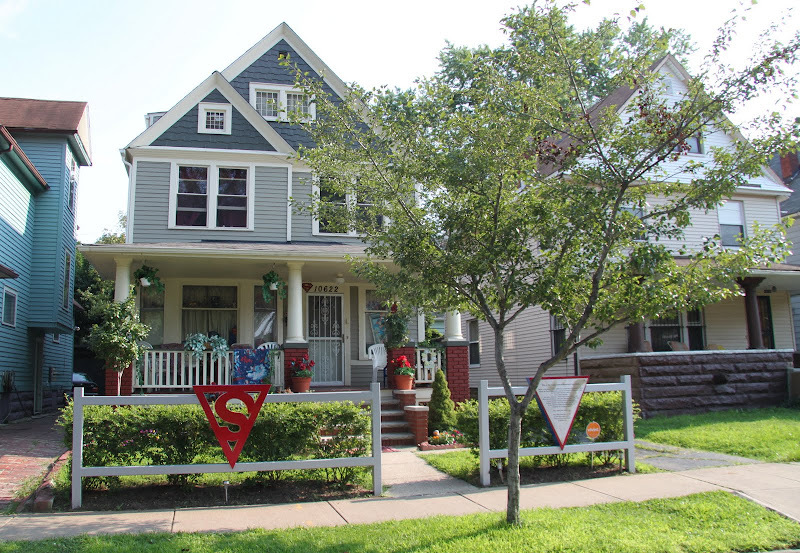 we had some time to kill after before meeting some other friends for dinner, so after visiting carol and john's comic shop, we headed over the cleveland's glenville neighborhood and checked out the birthplace of superman. o superman (1981) - often considered laurie anderson's break-out song. did you know that in addition to being a brilliant sculptor, musician, composer and performance artist, in 1970 laurie was the illustrator for the underground comix baloney moccasins!? Ah, Laurie Anderson! Always a good way to start the day. Thanks, Kim. Sweet story mouse! Did you know that Shuster was born in Toronto? And Christopher Reeve was never more a hero to me than when he bravely dealt with his accident and paralysis. Very nice : but if I had a choice, I would prefer my name tattooing in gold old Times Roman. The birthplace of Superman? Who knew? What I really want to know is what on earth is happening in that Secret Identity comic book!!! Love the picture of Winston being petted and, well, as Saretta mentioned, there's an interesting book on that shelf! !